My sister made these for us one Christmas at her house. We were combining a bunch of appetizers and calling it a meal, but this was the one everyone kept coming back to. So tasty! And they were good hot and after they had cooled down, too, which is a lovely characteristic for an appetizer to have. Anything else you would add to these? The kick from the Ro*tel is awesome, but I wonder what other flavors might be fun to work in? Don’t forget! Google Reader is, sadly, disappearing soon. Blog Lovin’ is a great alternative, and you can follow OPK with the button on the top right. Stop it! I’m trying to be good this morning and now I want to fake being sick and go home and make these. 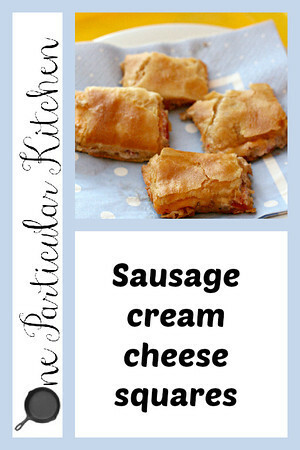 Cream cheese & sausage? SOLD! I know!! I, sadly, have none in my house right now. I really want to fix that. We love these but I’ve never tried them with Rotel. I’ll definitely be doing that next time! Ohhhhh I like the way you think, Bev! OMG….this sounds so easy and fab! Every single ingredient in this recipe is in my Top 10 favorite things. Believe it or not, I’ve only come to worship Ro*tel within the past year or so. I think I was scared that it had to much heat, but now, especially when it is mixed with sausage and cream cheese, it makes me swoon. Oh it is one of my favorite things in the world! And you know there’s a Ro*tel mild if you ever need such a thing!